Inventory We are a resale marketplace, not a box office or venue. Ticket prices may exceed face value. This site is not owned by Oak Mountain Amphitheatre . Oak Mountain Amphitheatre is the largest outdoor venue in the state of Alabama. The Oak Mountain Amphitheatre box office is located at 1000 Amphitheatre Drive in Pelham, Alabama right outside of Birmingham. There is currently no general admission seating in this outdoor venue. 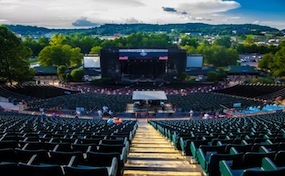 Oak Mountain Amphitheatre tickets have included Jason Aldean, Zac Brown Band, Dave Matthews Band, John Mayer, and many of the nations hottest touring performers. OakMountain.AmphitheatrePelham.com is an independently owned and operated company that specializes in providing low prices a wide array of inventory online for all secondary market events. Tickets may be below or above face value and prices can change hourly. We are not affiliated with any official supplier, box office, or website. To order tickets to all Oak Mountain Amphitheatre events simply click on the performance of interest or pick up the phone and call our operators at anytime.